Oil's status as a strategic commodity undermines U.S. national security and weakens the U.S. economy. Reducing oil's strategic importance requires breaking its virtual monopoly over transportation fuel. The United States Energy Security Council is focused on diminishing the inordinate strategic importance of oil, which stems from its virtual monopoly over transportation fuel. Click to read the Mission Statement. Olah in the Wall Street Journal: A Chemistry Breakthrough That Could Fuel a Revolution. Johnston in the Wall Street Journal: Natural Gas Exports and the Mythical 'Sweet Spot'. McFarlane and Olah in the Financial Times: Let the market decide our energy sources. Woolsey in the Geopolitics of Energy: Destroying Oil's Monopoly and OPEC's Cartel. 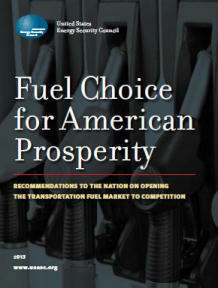 McFarlane in the Wall Street Journal: A Flex-Fuel Mandate Is Pro-Market. 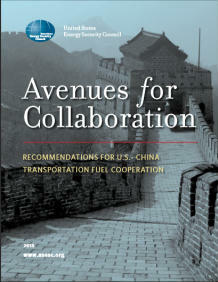 Ridge and Peters in the New York Times: The Methanol Alternative to Gasoline.